The unique ibrain air tube radiation free earphone adopted unique acoustic channel technology, and metal shield wire isolate the radiation of conductor electromagnetic waves technology. It's the first -rate radiation free earphone in the world. Shanghai Zhongchangjiang a manufacturer specialised in air tube anti-radiation headsets established in 2005. With a faculty of more than 2000 employees, the company can provide a annual productity of 3000, 000pcs. Since IARC of WHO comfirms mobile phone cancer link in May 2011, more and more people are searching anti-radiation mobile phone accesories for their personal health. 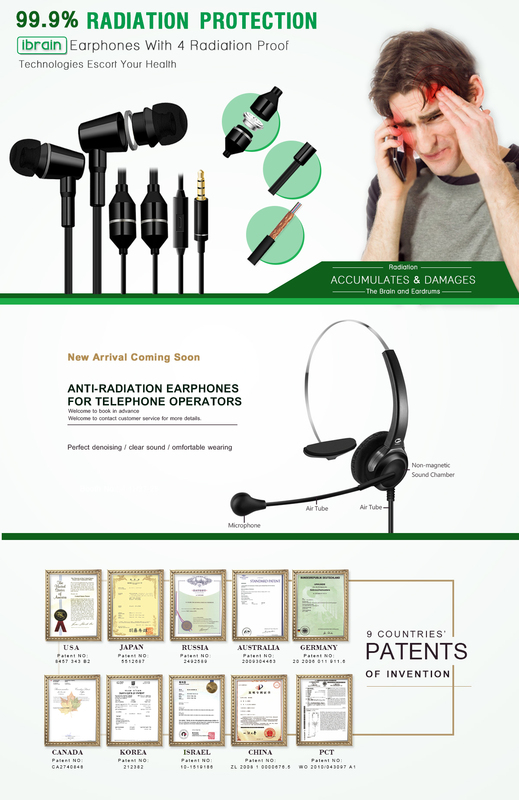 Our air tube anti-radiation earbuds are patented in China and registered at WIPO under PCT rules. Our patent will be valid in many countries in the world very soon. Seek this opportunity to contact us for a business relation, you may be the sole agent of this product in your country or district. Rememer us by Safeland, ZCJ TubeTalk headsets will save your health.